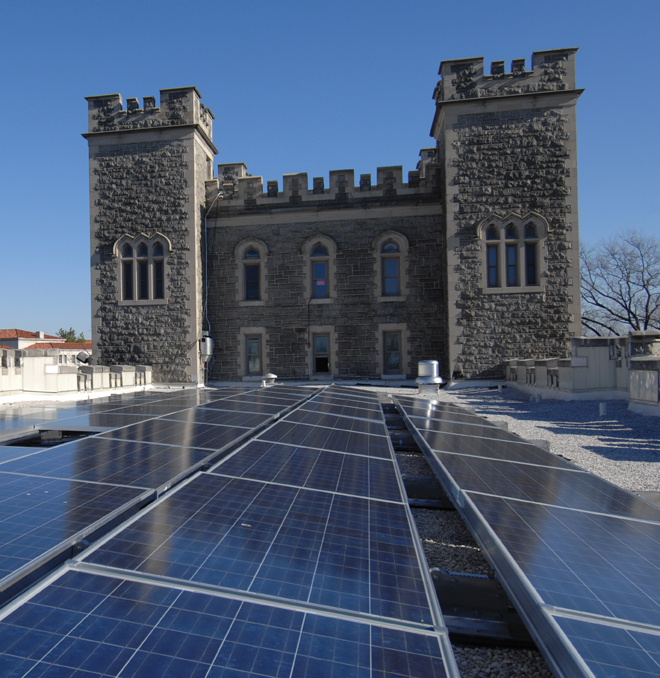 The Catholic University of America in Washington D.C., along with installation partner Standard Solar, took on a demanding project integrating a solar power system on seven campus buildings—one of which is more than a century old. In 1889, when the Catholic University of America opened its doors in the District of Columbia, solar power was what farmers used to grow crops. Professors at the time couldn't have imagined that 124 years later the university would become a beacon for sustainability and house a 682 kW solar facility, the largest in D.C.
C.J. Colavito, director of engineering for Standard Solar, which handled the solar installation, says integrating a solar power system onto seven campus buildings—one of them more than a century old—was technically complex, requiring a variety of skills and different types of technology, but it was also incredibly satisfying. "Catholic University has a very targeted sustainability effort, and they're one of the few customers whose main reason for installing solar power is not to save money," he adds. "The primary reason is to be more ecologically friendly and to support the student body's demand for green energy and a more sustainable campus." Like many projects, it started with solid relationships. Standard Solar had a relationship with Washington Gas Energy Systems, the larges electricity supplier in the state of Maryland and Washington D.C. Both Washington Gas and Standard Solar had existing relationships with Catholic University. "When we brought Washington Gas in as our system owner/PPA provider, it went together very smoothly," says Colavito. "It also helped that Catholic University has a very smart and politically savvy energy manager that really ran the project and pushed it through the university to get all the proper approvals." It's a good thing that all the players got along so well because the three-phase project had numerous and unique challenges. "One of the most challenging things on the development side was that the campus has many buildings, and we probably looked at over 30 different buildings to site the solar on for Phase 1, before selecting the final four that we went with," says Colavito. "We did preliminary drawings and PV system layouts for over 30 buildings, and we probably changed them all twice." • Structural capacity. Could the roof support the ballasted PV system? • Rooftop condition. Would the roofs hold up for the 20 years the PV system would be in place? • Irregular shapes. Would a tall, skinny, or odd-shaped roof support the rooftop system? • Building financing. Would the current bonds/financing of various buildings allow for this kind of project. "Financing of the building and the contingencies around that financing invalidated about half the buildings on campus," says Colavito. Seven buildings were selected to house the total 680 kW of solar power, and about 90 percent is on three buildings. "That means we had four buildings that were tiny—not exactly ideal installs. They required even more project management and engineering effort than the larger buildings. So it was very challenging," says Colavito. For Phase 1, Standard Solar selected DuFour Athletic Center (122 kW), Aquinas Hall (104 kW), Flather Hall (35 kW), and Gibbons Hall (32 kW), and construction got underway in 2009. Seven buildings at the university were selected to house the total 680 kW of solar power, and about 90 percent is on three buildings. That meant four of the buildings were small—not exactly ideal installs. Castle-like Gibbons Hall proved to be a challenge, especially in the beginning, recalls Colavito. "The building is extremely old, has a large tower in the middle, and no access to the roof. You had to go up the stairwell in the middle and crawl through a small window that was only about two feet wide. You had to wiggle through to get up there, making site visits and development and planning tricky." Once construction got underway, scaffolding was erected for access, but there were new issues to address. "We had to push the solar panels out to the farthest ends of either wing, so they wouldn't get too much shading from the tower in the middle," explains Colavito. "Because of the shade, we used four separate SMA Sunny Boy 7000 string inverters to run that 32 KW system. We have two string inverters for each wing, with one dedicated to the inside half and one designated to the outside half of the system so that the shading on the inside portions from the large tower wouldn't affect the outside as much." Gibbons wasn't the only building with challenges. Aquinas is an office and classroom building, and Flather Hall is a dormitory, so there were security concerns. Standard Solar had to work very closely with the university and make sure that students weren't disrupted. "We knew exactly what days were study days, test days, and holidays, and we did our best to get in and get out without disrupting things, and we made sure the meat of our construction activity didn't happen during key times in the university schedule," says Colavito. "It also helped that the students were very interested and supportive." For phase one, Standard Solar went with Suntech solar modules. In addition to the four SMA Sunny Boy 7 kW systems used on Gibbons, Standard Solar chose Satcon inverters for DuFour—two Satcon 100 kWs and one Satcon 30 kW. Because of reroofing schedules, the DuFour Athletic Center was the only building that got additional PV during Phase 2. "We were only allowed access to one section of DuFour on Phase 1 because that was the section they planned to re-roof immediately. Then when they re-roofed another section of the building, we went in and installed another 120 kW," explains Colavito. makes excellent products that have high reliability and good pricing—and that's why they worked with them, says Colavito. Phase 3 wrapped up in 2012, adding an additional 268 kW in Trina Solar modules. • An additional 77 kW to DuFour— bringing the total to 319 kW, or half the PV on the campus. Phase 3 had challenges from the start. "We had already cherry-picked the best buildings of what was available, and we had to get creative," says Colavito. "The university was also more interested in getting some token systems for demonstration and for solar to be on some key buildings." An example was the ballasted roof mount system on Pangborn Hall. "11.2 kW is a very small system, especially in a commercial setting. We wouldn't have been able to do a job that small if it wasn't rolled in with three other sites." The Grounds Maintenance Complex has a standing seam metal roof and was originally supposed to be 26 kWs. After a structural analysis, engineers would only allow 8 kW, but Standard Solar made lemonade from lemons. "We put in two nice, clean rectangular blocks on the roof, and it complements the Grounds Maintenance Complex nicely," says Colavito. "Unfortunately for us, it cut the project down in size and made it more difficult to do, but because Catholic University is a partner of ours and so is Washington Gas, we just rolled with it and re-designed the array and figured out how to make it all work." On both the Grounds Maintenance Facility and Pangborn Hall, Standard Solar used Power-One, three-phase, 10 kW string inverters. "There were only a few companies at the time when we were first designing these projects that offered a true three-phase string inverter." Financing also became more complicated by the three-year project span. "The renewable energy credit markets, the electricity markets, and the cost of PV systems changed drastically between 2009 and 2012," says Colavito, noting that the DuFour building, which was part of each phase was especially unique. 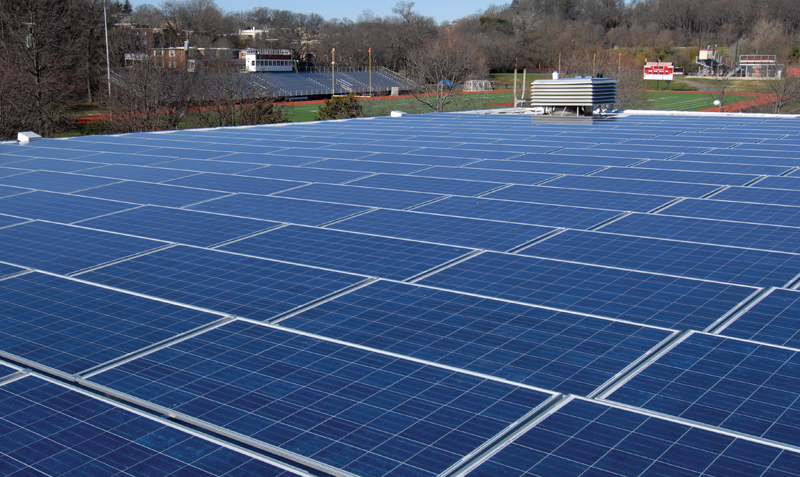 "Each time we added solar power to a building, it was a completely different PPA rate with a completely different contract between the system investor and Catholic University. So we have three separate inverters for a 300 kW system." "Each inverter output needed to be separately revenue grade metered and separately monitored because they were all built differently," says Colavito. "In the case of DuFour, we were going back and undoing some of the work we had done to upsize it and re-do it again." 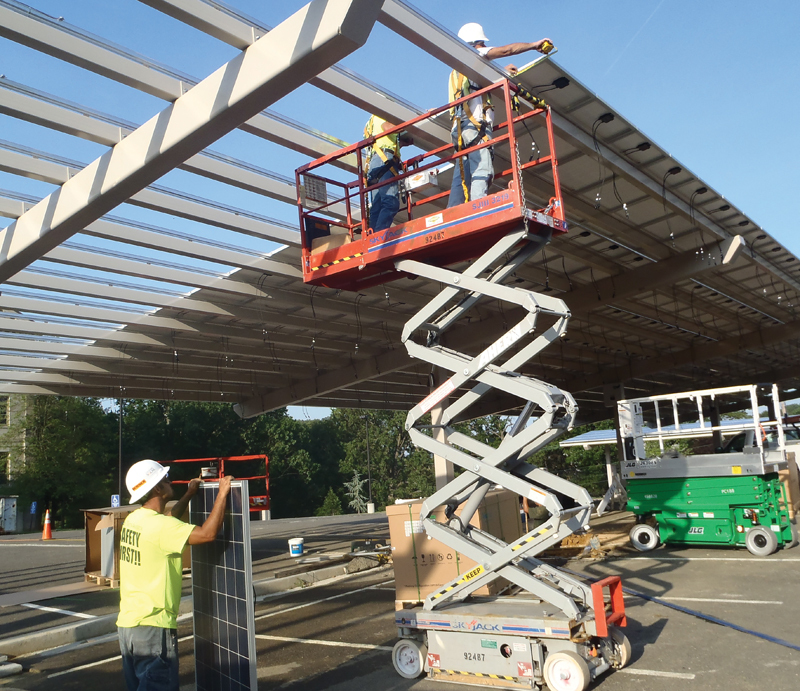 The parking lot required a charging station, but not before the removal of several light posts to put up the solar array. "We then replaced that lighting with LED undermount lighting on the bottom of the canopy. Also, the parking lot isn't flat, and it has multiple orientations of the array." Standard Solar participated in several student outreach programs during the three years. "I personally gave tours to engineering classes and renewable energy classes of the solar power systems during and post construction. Standard Solar, along with Washington Gas, also supported and sponsored a solar picnic table design competition." The picnic table is definitely a statement. "It has integrated batteries, a little monitoring system with charge controller and inverter to supply AC loads. It's also got some flexible thin film modules that adhere to the top of the awning on the picnic table," says Colavito. "I can't say it was easy to manage and build, but we made it work, and it was important to the university." Now students can sit and eat outside the main student center, while charging iPhones, laptops, and other mobile devices. The student support has led to Standard Solar sponsoring the solar decathlon team, which will be the first such team for Washington D.C. universities. The project also resulted in a couple of interns and a new hire at Standard Solar. "That student was on one of my first tours in 2009," says Colavito. The ribbon cutting ceremony this past September wasn't just a celebration of a successful 2,600-panel PV solar facility, but also of creativity, dedication, and teamwork. Colavito says he's proud that Catholic University is a ‘three-peat' customer. "I think that speaks volumes." And the university professors from 125 years ago would be impressed too.